Eszter started to play the violin at age of six at the Pál M. Bodon Music School in Kecskemét (Hungary). In 2005 at the Zoltán Kodály International Violin Competition in Galánta (Slovakia) and the next 3 editions she gained the first prize. In 2007 she received second prize at the János Koncz National Violin Competition; in 2011 and 2013 – the second and the third prizes at the International Competition for Youth “Virtuoso – Etudes and Scales” in Zagreb. 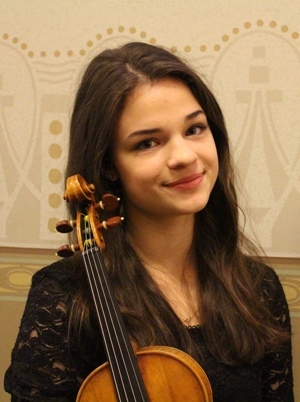 In 2014 she was the first prize winner at the Ede Zathureczky Memorial Competition in Budapest. Eszter had master classes with many teachers, such as George Pauk, Simon Standage, Zakhar Bron. She had opportunity to play solo with the Chamber Orchestra of Szekszárd several times in Hungary and in Germany, with the Pál M. Bodon Chamber Orchestra and the Danish Youth Symphony Orchestra, also – with the Symphonic Orchestra in Kecskemét at the Spring Festival of Kecskemét last year. In 2013 she had an opportunity to make a recording to the Young Talents CD of the New Europe Foundation of MOL Rt. In 2010 Eszter had a succesfull entrance exam to the Special Talents Class of the Franz Liszt Academy of Music in Budapest, where she has been studying for five years, and her teachers were Lajos Földesi, Eszter Perényi and Ádám Banda. In 2016 Eszter won Grand Prix at the 10th International Balys Dvarionas Comepetition in Lithuania, performing Balys Dvarionas Concerto with Lithuanian National Symphony Orchestra at Lithuanian National Philharmonic Hall. Now Kökény is a student at Franz Liszt Academy of Music. You can listen to Eszter here. If you are interested in working with Eszter, please get in touch with the EMCY Office.